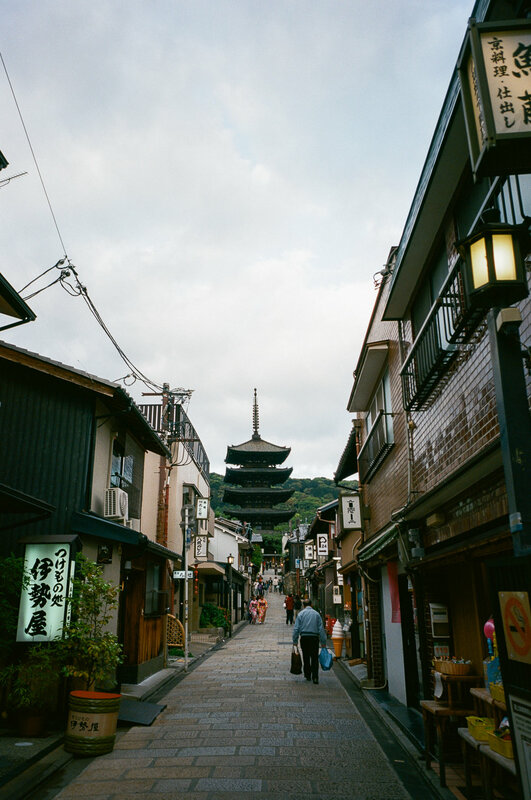 Our final destination in Japan was Kyoto, one of the biggest and most famous tourist hotspots of the country. 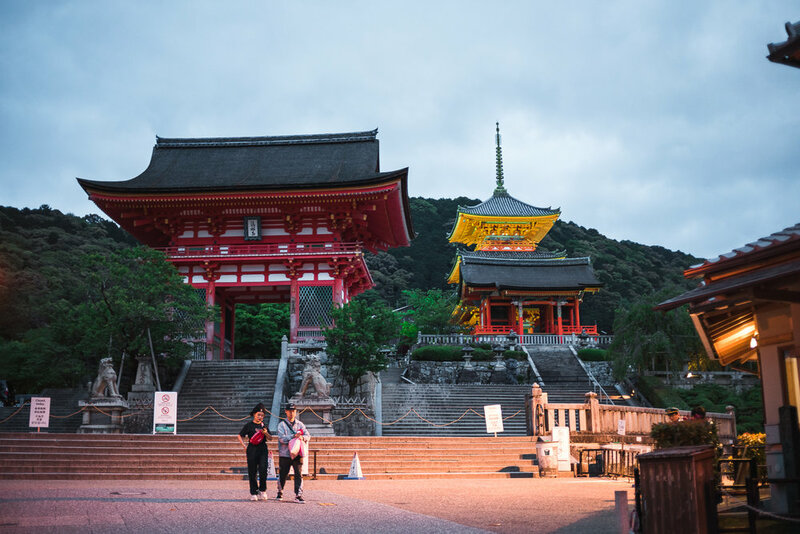 Home to some of the most famous shrines and landmarks, we set out to see as much of the city as we could in our 8 hours there. In hindsight, spending two days there may have been a better idea due to the disparity of the landmarks: most destinations are scattered on the outskirts of the city, making transitting between them less than ideal. Despite this concern, we were able to check off most places on our list without feeling too rushed, but we did felt like we weren't able to truly get to know the city beyond a surface-level glance. Kyoto became a blurred itineary of landmarks at times, but it didn't make the sights any less impressive than they were. Upon arrival, you're treated to a view of one of the most impressive (but also confusingly laid out) transit hubs in Japan. 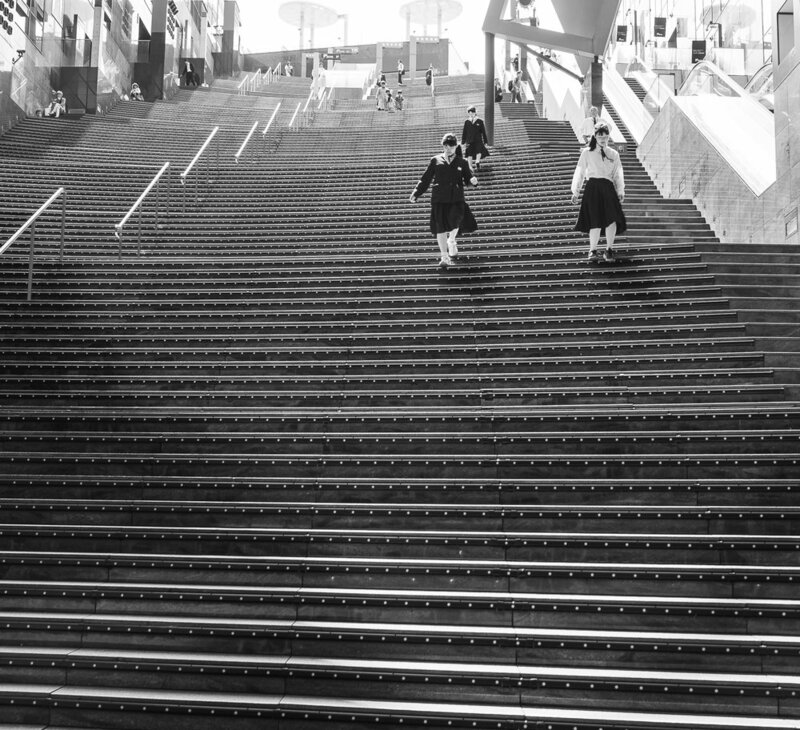 The density of people, contrasted the sense of openness of the station's architecture, creating a surprising feeling of being at peace despite the throngs of tourists. I feel like we could easily spend hours at this station alone, capturing people going about their business here. This was also the first of many, many places we saw selling Kyoto-exclusive matcha goods. You know you're in a good place when the 7 Elevens have matcha crepe cakes. After grabbing a quick breakfast, we took a train over to Arashiyama to see the famed Bamboo Grove. If there's one thing we noticed in Japan, it's that it's a country that really likes dedicating places for one and only one thing. Take for example, Hitachi Seaside Park with its blue flowers, the Fox Village, the Monkey park beside the Bamboo Forest, the list goes on and on. Pardoning the tangent, the Arashiyama was quite a distance away from central Kyoto. Despite this, the streets were packed to the brim with stores and restaurants catering to tourists. After weaving through dense crowds of fellow tourists, we finally arrived. 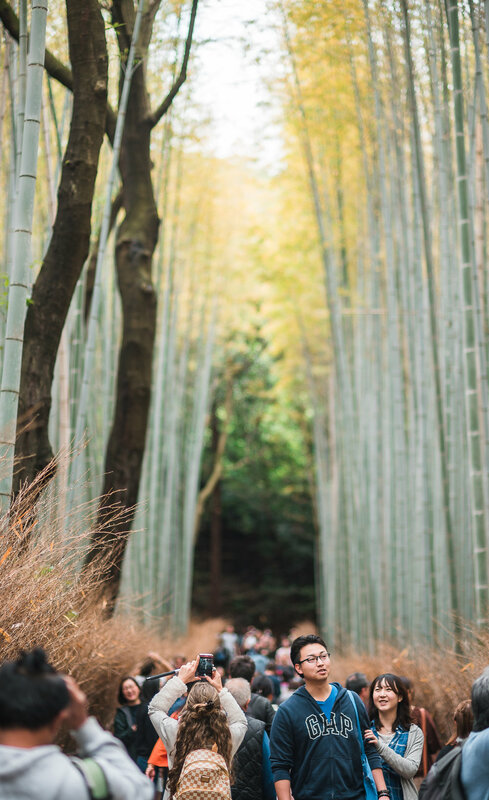 One of the most famous destinations in Kyoto, the Bamboo Grove was almost unreal in person. Looking up and walking through the forest was a tranquil experience, until you almost lose an eye from an errand selfie stick and become grounded back in reality. Crowds pack these paths early on in the morning, so if you want to come here, get here earlier than we did (around 10am was not a good time). There were several temples and the aforementioned Monkey park located nearby, but our schedule required us to move on to our next destination soon. After narrowly dodging a taxi (yes, cars are allowed in here), we began making the trek back to the train station, hitting off another few locations on our way. A sidenote: Kimono rentals are extremely popular in Kyoto. Some destinations contained more people donning them than regular streetclothes. We decided against it however, as we valued our mobility. I've heard it feels like being strangled by ten layers of fabric, and the day was warm enough as it was. If you do rent one however, I've heard that it's adviseable to get one early from somewhere that's convenient to return to at least 30 minutes before they close (usually around 4-5pm). The street between the train station and the Bamboo Grove, despite being an obvious tourist trap, was still filled with little details that caught our eyes. One of those details was a sign showcasing photos of beautiful matcha parfaits. We decided to take a closer look for research purposes. One parfait and a houjicha latte later, and we were back on track to our next destination just along a riverbank. 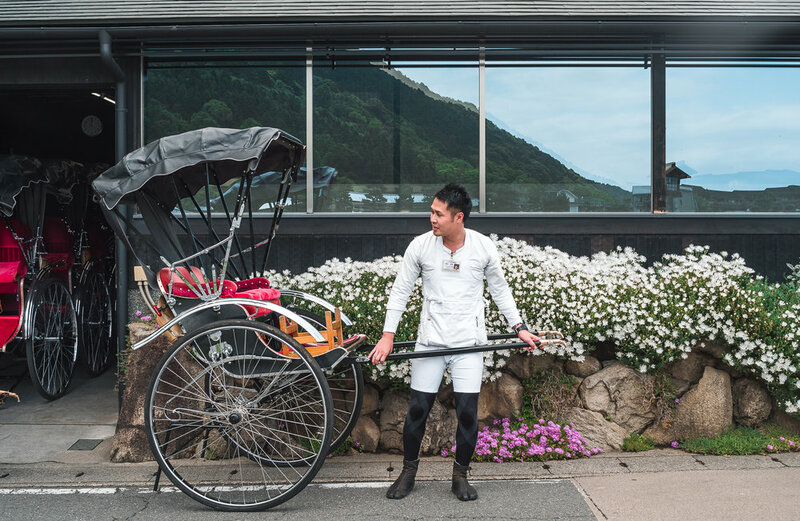 Among the kimono-donning tourists, these Rickshaws were very common sights around Kyoto, especially so in Arashiyma. We didn't ride one, but we did spend several minutes trying to capture them in action. Even before we could see our next destination, we saw the crowd surrounding it: it was clear we were in for a long wait. 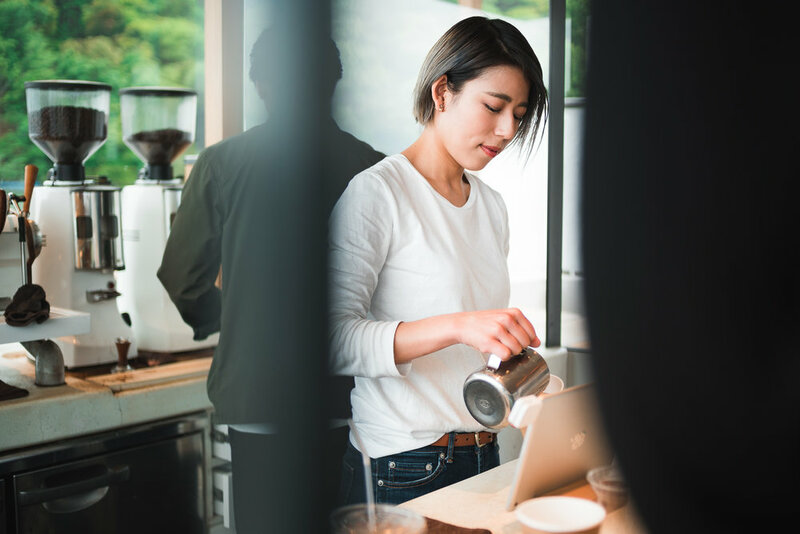 No doubt one of the most aesthetically pleasing cafes I've ever seen, Arabica is situated on the riverside of Arashiyama and as a result, is constantly filled with tourists clamouring for a selfie with their trademark iced latte. They have their own coffee farm in Hawaii and roast their beans on site. In fact, I saw a lady purchase a bag of beans they roast just for her, warned that they were still piping hot as she received them. While there's no seating areas in the petit space, there's plenty of room to sit and relax in the surrounding area outside the cafe. Refueled with caffeine, we meandered our way back to Kyoto Station to try one of the most famous tea chains from Uji. 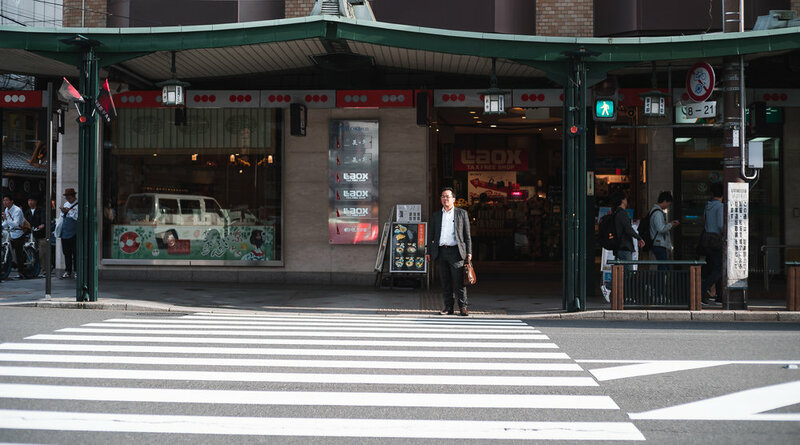 We were initially planning to take a trip out to Uji on our way back from Kyoto to visit the flagship store of this chain, until we found out there was also a location in Kyoto Station. While the flagship offers some exclusive items, the experience for the most part was relatively similar. We had the matcha soba set, an iced matcha drink, and a houjicha latte. We didn't actually sample any of their famed ice cream desserts as we already had a parfait earlier in the day and didn't think we had the stomach capacity for another one. If you're pressed for time, the Kyoto Station location is an excellent way to sample their offerings, but the Uji experience is still allegedly superior for the full experience. 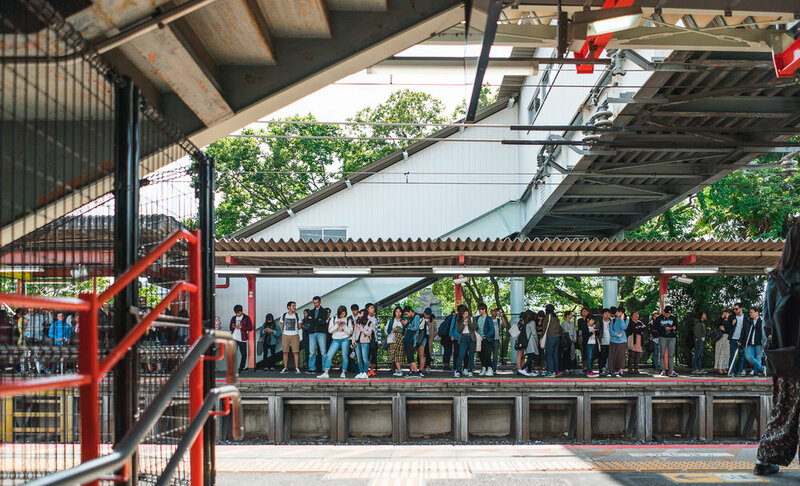 Our stomachs filled and our energy recharged, we hopped on a crowded train to our next destination. 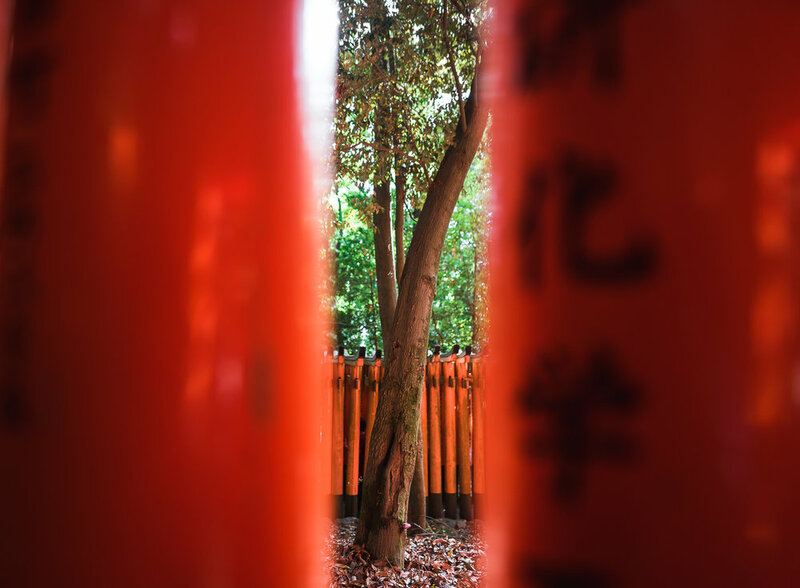 Aside from the bamboo grove, this may be one of the most iconic shrines in Kyoto. 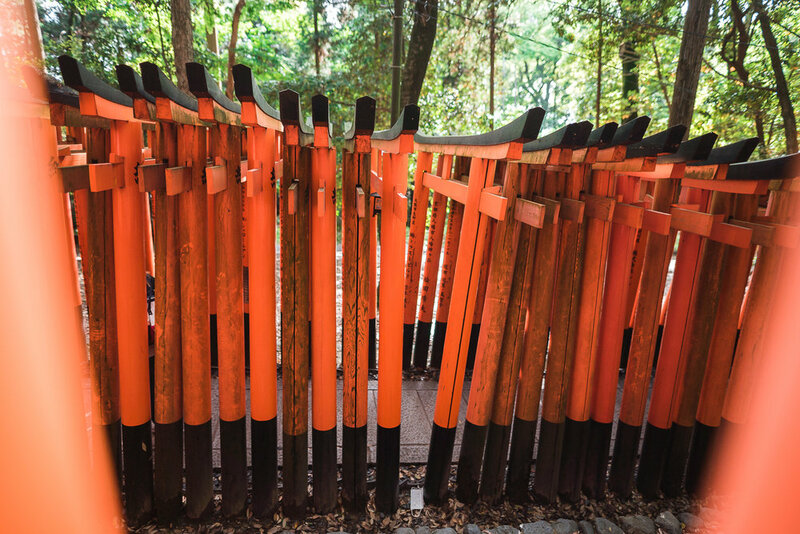 While throngs of tourists flood the gates nearly round the clock, it's surprisingly easy to find a bit of peace and quiet among them, especially since the gates go on for more than 4 kilometers up a mountain. The further you go up, the fewer people follow. Each torii was apparently donated by a business, as the shrine was built for a god that brings success to commerce. Directly outside, you can find many street food vendors selling everything from octopus to mochi. We wandered through, making our way towards the train to Gion, famously known as the Geisha district. As we walked through the streets, it was clear that the vast majority of people filling them were fellow tourists. Given the path we were taking, it was to be expected, but we couldn't help but wonder what local treasures we were missing by not straying off the main roads. If anything, the number of kimonos we saw only increased when we reached the Gion district. While some streets around the area felt rather tame compared to the rest of what we experienced so far, the number of bright and colourful outfits we saw gave it pops of intruige. We had Tsujiri in our iteneary, and initially planned to just stop in to look around. The promise of an extra rich matcha soft-serve won us over though. It was as delightful and as refreshing as we anticipated. During our ice cream break, we set about trying to find a particular temple we saw on Instagram. Apparently, witholding photo locations is a thing that youngsters are doing now, but after several searches for "Kyoto Temple" and "Kyoto Pagota", we found it: the Hōkanji Temple. We rushed to get there before sundown, snapping photos along the way. Upon arrival, we were slightly out of breath, but relieved to still have time to explore. We also noted that there was a Arabica Coffee location near the temple. Save for the occasional tourist, the back paths and side streets we followed up here were the most peaceful we encountered in Kyoto. When dusk hit, the magic came out. The orange streetlights combined with the cool tones from the dimming clouds brought the winding alleys to life. Realizing we weren't far from another temple, we attempted to climb further up the hill to visit it before the light faded. Upon arrival however, we were disappointed to find that it had already closed. The walk did allow us to explore the streets while they were nearly bare however, so for that we were grateful. We ended up having a quick convenience store dinner before heading back to Osaka, hoping to get back before it was too late. Despite taking a pretty touristy route through Kyoto, it was a beautiful city and the perfect way to end our stay in Japan. 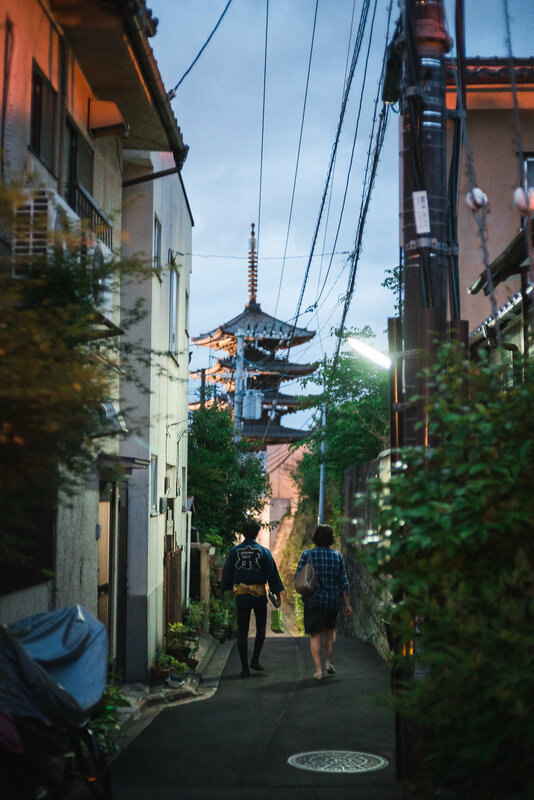 There's that corny saying that 'getting there is half the fun', but in Kyoto, it really was. Some of my highlights were actually between the train stations and our final destinations, peeking at the intricately and at the same time holllistically beautiful streets. 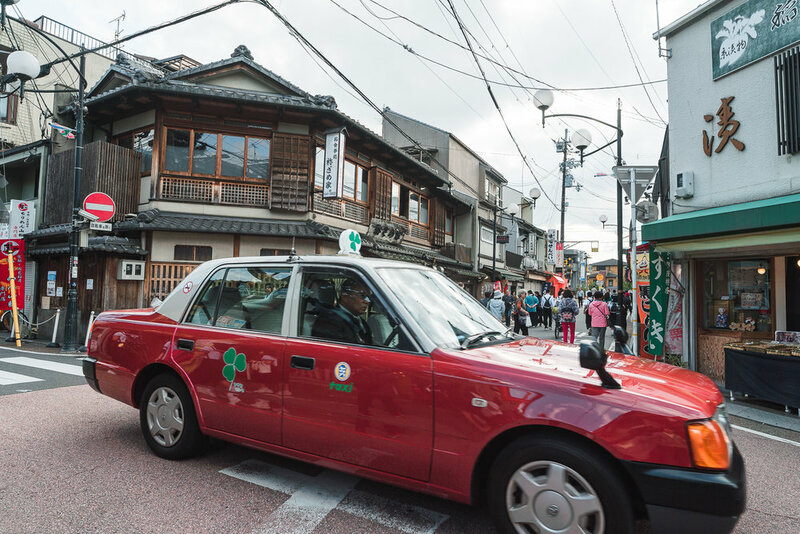 While Tokyo was more or less hypermodern and sprawling with technology, Kyoto seemed much more old-fashioned, purposefully emphasizing its age and heritage. Our next day was spent taking the bullet train back to Tokyo to prepare for our flight to our next destination: Seoul.